CiraSync can purge Outlook contact folders globally across all of the mailboxes in your Office 365 tenant. It will remove the contacts from a subfolder, and also remove the subfolder. This process can be run on demand and can target specific users with a collection. Note: This capability can be very destructive and also difficult to reverse. Test on several users before running globally. If you need assistance, contact CiraSync support. In the CiraSync dashboard on the top right corner, click on the system menu. It is the icon to the right of your (1) name. Select Settings (2) and you will see the settings page as shown below. Choose the Folder Purge menu (3). Click Edit (4) at the Select users label. 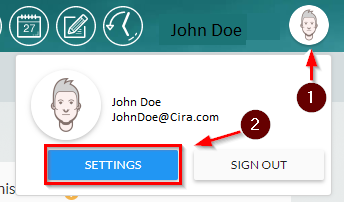 Now the Select Users or Groups dialog will appear. In the edit box (5) Search the user or groups (5) enter a user or group. In this case, we suggest you test with a single user where you are able to examine the results on an Outlook Desktop before running the action globally. Click the plus + sign (6) to select your target(s). Each target will appear on the right column display (7). Click OK (8) and you will return to the dialog box is closed. As is noted in Red: This action cannot be undone via CiraSync. Please use with caution! Enter the name of the subfolder (9) for example “CiraSync” if that is the name of the subfolder you need to purge. If you need to delete contacts and the subfolder, check the box to Remove subfolder after purge (10). Click Run Folder Purge to execute (11). We suggest you monitor the folder purge progress (12). If needed, all purged contacts can be found in the Deleted Items of the respective user. If you have run the test on a single user and it was successful, you can now expand the test to include groups of users, or All Mailboxes.